Though inevitable, weeds are a gardener’s arch nemeses. Getting them under control can be time-consuming; but the more you manage them, the easier and quicker it will become to get rid of them. A good tip is using approximately two inches of mulch in your garden. This should not only retain moisture for your plants but will also suffocate weeds and prevent them from growing. Your garden needs regular pruning, particularly any fruit trees, overgrown hedges and buds. Trimming the excess growth right down to their base will make your garden look neater and create more space for your garden life to grow and flourish. Since autumn has just passed us, what better time to clean up all those leaves that have fallen onto your lawn and plants. Get the rake out, gather them all up, and make your garden tidy again. 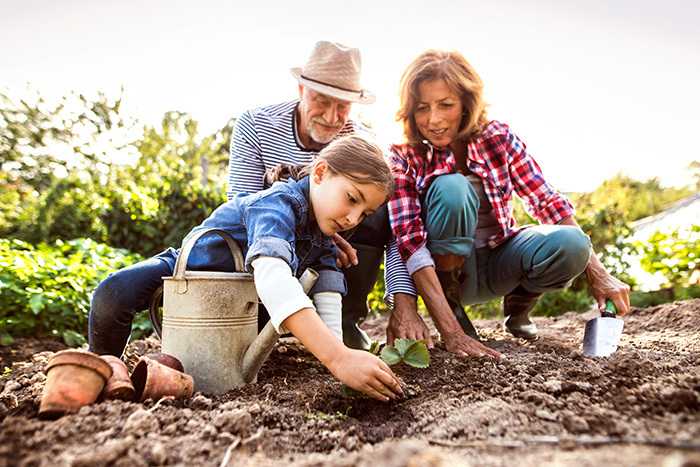 One of the wisest jobs you could undertake at this time of the year is sowing your fruits and vegetables, as the time they will spring into life is just around the corner! So, with your sowing kit ready, make sure you are prepared for labels, module trays, seed compost, and a couple of markers. It would almost be a crime not be get so prepared for sowing and then not buy tomato seeds, so, if you haven’t already, now’s the time. The best time to plant them is at the end of February. There’s really nothing like fresh peas straight from the pod, and early types such as ‘Feltham First’ and ‘Early Onward’ are hardy and should be sown at the beginning of the new year. Garlic is another vegetable which should ideally be sown as early as possible in the year, while onions, although it’s traditional to sow them on Boxing Day, can actually be sown anytime in January. Winter is the perfect time to plant hedges and barerooted trees, because by the time spring comes around, they will really start to grow and develop. Lining your garden with hedges may mean the world of difference in terms of enclosed privacy in the warmer months, or it could just mean encasing your garden with a wonderfully attractive border. Pruning various growths in your garden such as Wisteria, Clematis, Cornus, Salix cultivars, Winter Flowering Jasmine and summer sideshoots, will do the world of good for when spring and summer come around. One particularly handy tip is to remove any faded flowers from your winter pansies to stop them from setting seed and encourage a flush of new flowers for the warmer months ahead. Covering your plants before nightfall arrives each day will mean protection against some of the coldest temperatures of the entire year. Do so before dusk as if you wait until darkness falls, most of the stored heat in your garden will have dissipated. When covering your plants, try not to leave any openings for the warmth to escape. When dawn breaks and the frost has thawed, remove the covers in good time. Delaying doing this could cause the plant to break dormancy and start actively growing again; which would make it even more susceptible to frost damage. For this job you could use bed sheets or blankets, drop cloths, or even an inverted flower pot or bucket.